Today i actually did all my jobs before doing anything creative: cleaning out the guinea pigs and letting them have a good run around our living room, french homework writing sentences using different tenses, and reading lots of a school textbook that belonged to a relative of my tutor and was written in 1879 (amazing! ), booking a day at a conference, booking a bed and breakfast for the start of our holiday at Easter, and cooking dinner and getting stuff ready for work tomorrow. After all that it was evening and i decided not to paper cut. I was needing to relax and didn’t want to end up rushing the foxes just to get them finished. I decided to draw instead. Obviously i chickened out at the idea of a window box full of petunias, and just decided to draw one! Before each picture i draw i look up potential images online. I loved the pictures of individual petunias, but freaked out at the idea of a whole window box where i’d lose the beautiful details on the individual flower. I could imagine myself just doing lots of dots of colour that probably wouldn’t even really look like flowers,so thought I’d focus on one instead. I love the process of looking at detail in something you would often glance over, and taking the time to really notice it. I’m not so happy with the next picture i did, though i enjoyed doing it. I wondered how i was going to do an essentially white flower without drawing the outline in black but then i thought about what i’d read on shadowcatcher’s blog about using negative spaces. 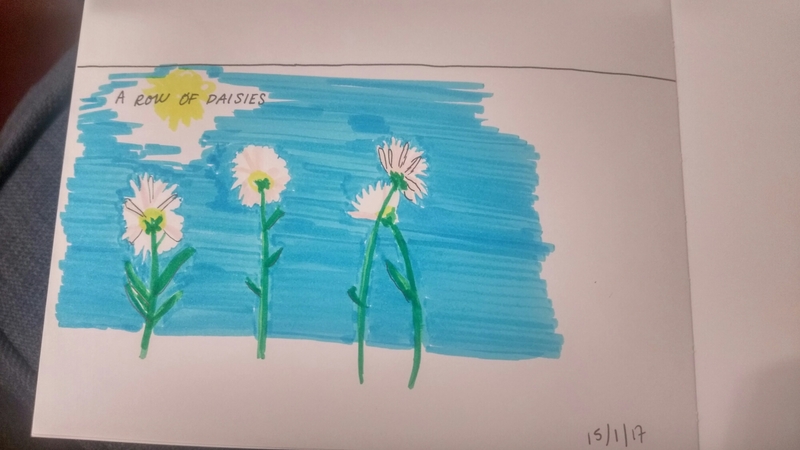 So i put the daisies against a sunny blue sky and i had my white flowers. 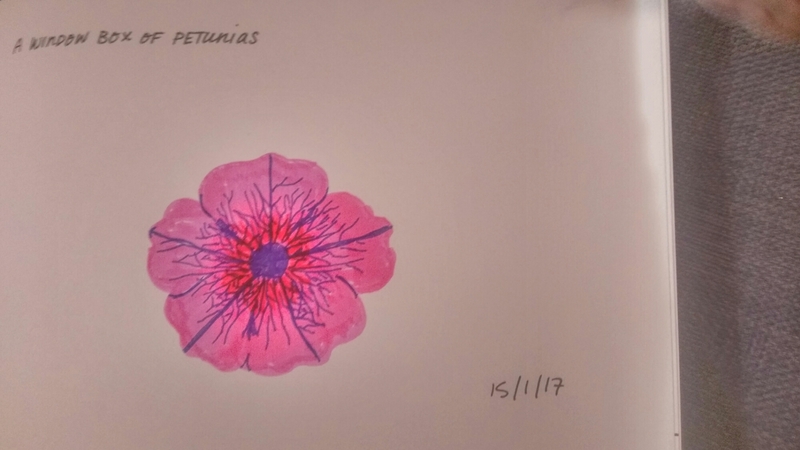 I used a pinky colour to show where petals overlapped and were shadowy as i didn’t have a grey pen. I then experimented with using the black pen to highlight edges, and was not happy with what i did. I envisaged it all rather differently and it just didn’t transfer onto paper! Still,i enjoyed the process if not the outcome, but then had to motivate myself to share not very good drawings on here. Here’s hoping they improve over time, but it seems they are getting worse each time i try something new at the moment! So today i actually got distracted from things i should have been doing and decided to paper cut instead. I was motivated by the fact that someone new started following my blog and commented on my posts… Thanks lillibella. So please do keep liking/comnenting/following as it will help me to keep going with this. Putting off French homework and booking various things i decided to carry on with the foxes paper cut from my paper panda book. 45 minutes later this is how far I’d got. 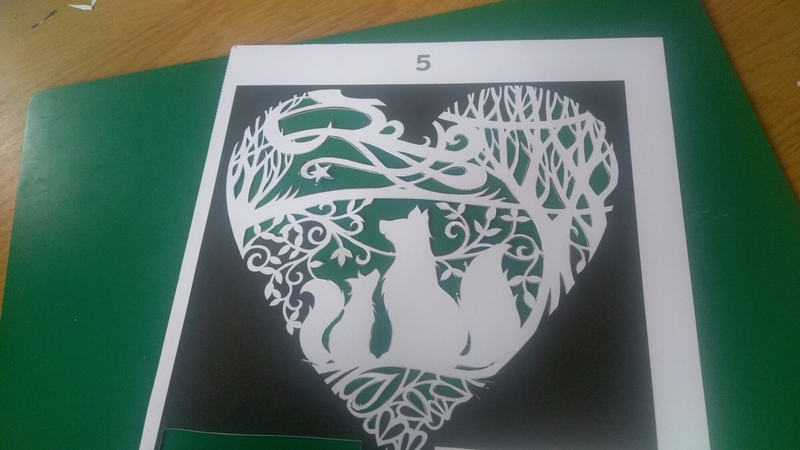 I got really excited about getting to cut the foxes, especially after doing the tricky, fiddly leaves. Several times i accidentally nearly cut through a thin branch, but so far i have avoided that or cutting off something that’s meant to be there. I know they can be fixed after, but i will be so annoyed at having to put extra time in to fix something i could have avoided. 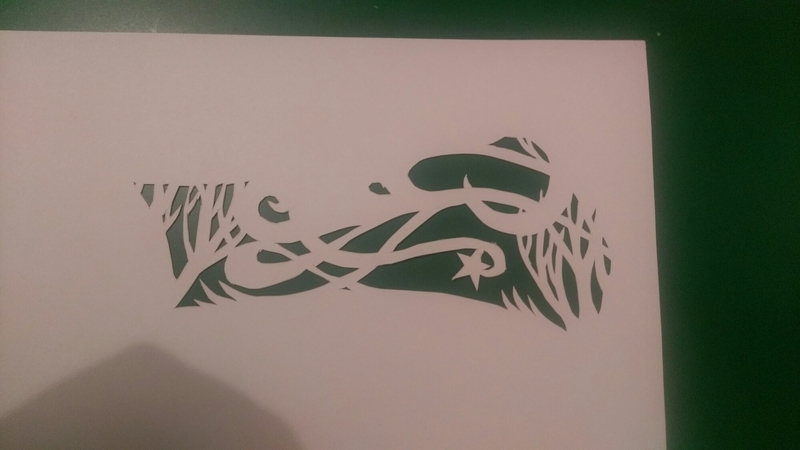 I think part of the way of avoiding mistakes like that might be to do the more fiddly bits when i start cutting, as i start losing focus a bit and getting tired after half an hour and find my cutting gets less accurate. 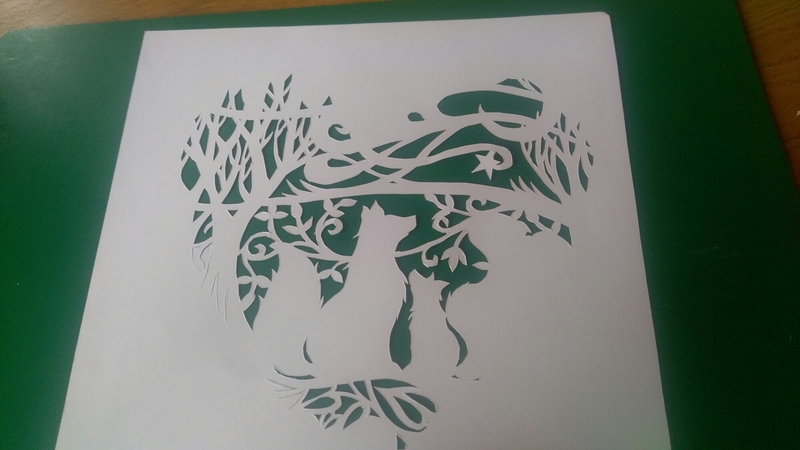 Today was the first time I’d done paper cutting in daylight, which involved lots of moving around to find the best place to sit so i didn’t block light. 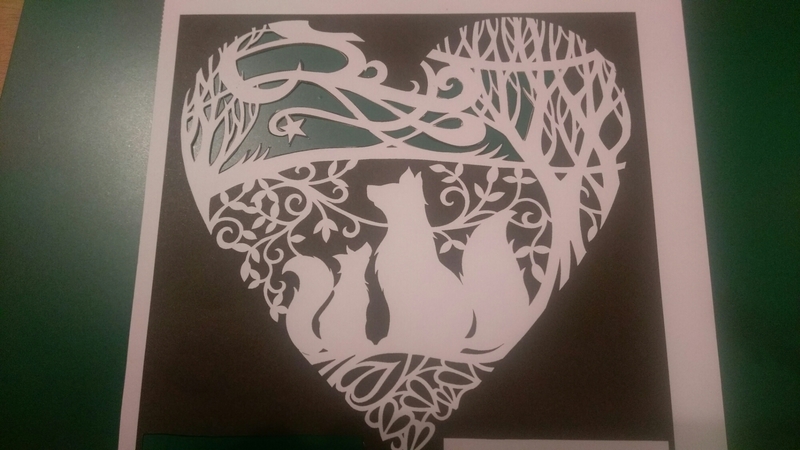 I loved cutting the foxes, and i really enjoy cutting long swooping lines that are a bit like a narrow elongated s as i find i can cut these smoothly. The worst thing to cut is a line that curls back on itself like a spiral… I can’t get them smooth at the moment. But the lovely thing is that when cutting I’m focused in on tiny details. When I look at the whole it always looks better than i think it will… Especially when I’ve turned it over to the proper side. 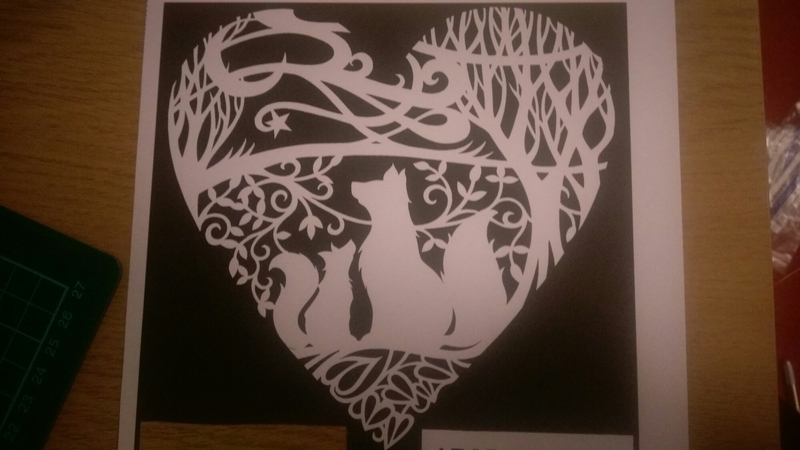 There will be a paper foxes part 3 at some point to finish cutting the whole design and then i might try mounting it on card! Here’s a quick blog before i go to work as a teaching assistant in a reception class in a local primary school. Last night i got home from work and decided to do half an hour of craft before reading a book. I started on the fox template which you can see above. The pattern is printed ready, and with this you cut away all the black parts and then flip the page over to see the design. I’ve discovered i most like cutting out the elongated triangle shapes, and i need to practice corners and getting these sharp on other shapes. It will be interesting to see how long it takes to cut the whole design. Cutting round the outside will be the last stage as this helps to keep the whole thing stable while cutting the other parts. This evening i had a bit of time after chilling out watching a film so i decided to put on paper what i had been thinking about for the next pictures in my draw every day book. 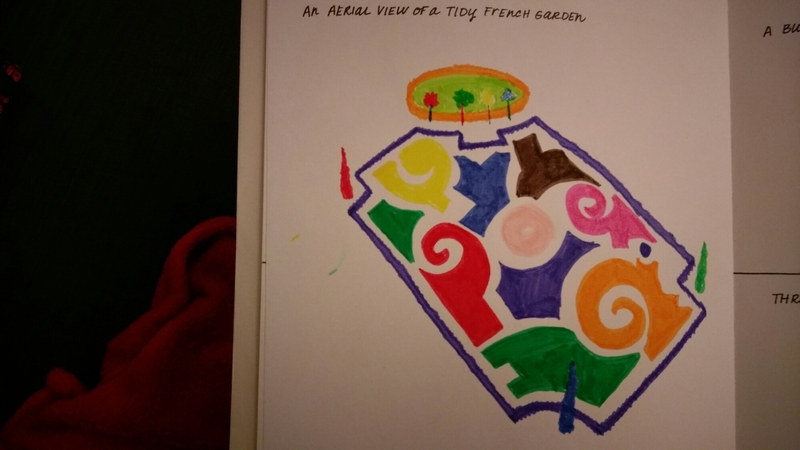 The first was an aerial view of a tidy French garden. I found a picture online, i think of Versailles, and was taken by the pattern in the hedges and pathways. I found it odd that the pattern wasn’t symmetrical as i think it might be in an English knot garden? But i loved how the pathways were also part of the design. Seeing as most of the drawing would be green i decided to take my lesson from yesterday and go multicoloured. Here i realised the issue with blogging… That i feel the need to post stuff even if I’m not happy with it! But it could be worse. I’m glad i did the different colours (i started with orange and purple in honour of Benjamin!). I’m not so happy that my paths aren’t neat like the photo. In the photo they’re very even widths, which they’re not in my drawing. But i do like the different colours and how they make me think of an abstract piece of art. 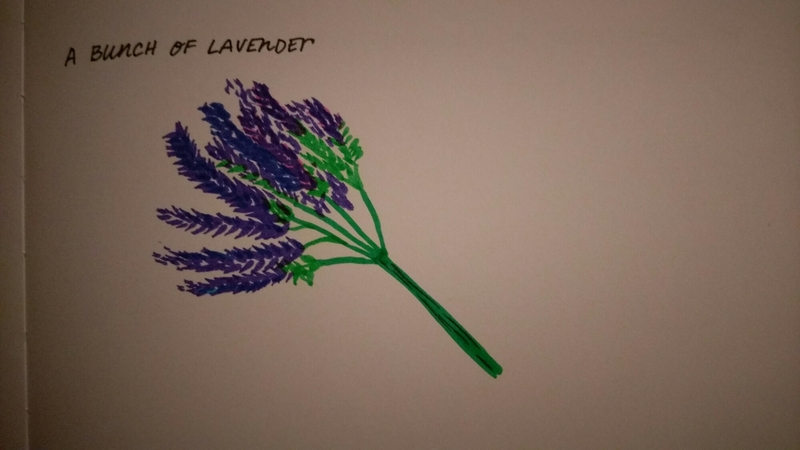 Having decided i wasn’t impressed with that i moved on to the next picture… A bunch of lavender. I’m not overly keen on the stalks, but i enjoyed ‘stamping’ with the brush tips to get the buds of lavender and playing around with putting other colours under the purple to get different shades. I definitely think the blues worked better than the pink! And that’s me for today! 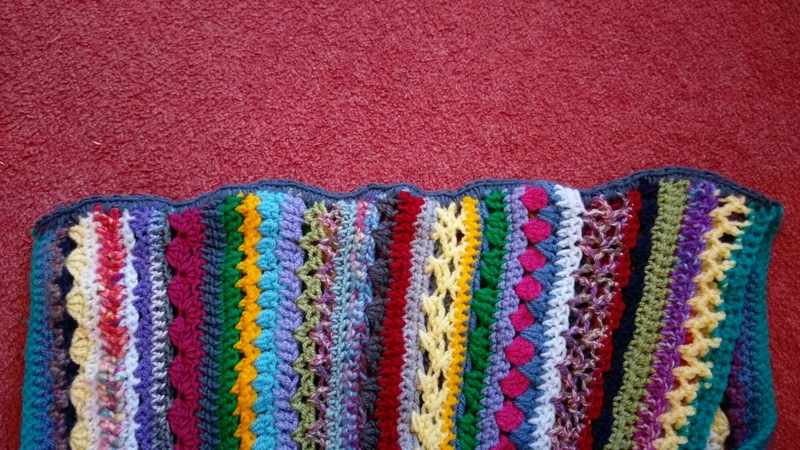 I’m pleased my blog has motivated me to be creative when otherwise i might have just sat and read my book, but I’m also rather amazed (and a bit freaked out!) that when i arrived at church wearing my infinity/mobius scarf people were greeting me with ‘ooh, is this the scarf?’! (not everyone actually went ooh!). I didn’t think anyone would really read this, and i’m grateful that some people actually are! After a morning in church where people shared testimonies of how God had worked in their lives this past year and over longer periods, my husband and I went to Gloucester Cathedral to meet with a group of people for communuion, prayer and afternoon tea. We were running late and the group were already gathered in the Thomas Chapel, which is my favourite part of the cathedral (other than the cloisters), with abstract-looking predominantly blue stained glass windows. The group were singing the first Noel together. There were only maybe 8 adults and 7 children there but as we walked round we could hear their voices echoing through the cathedral and it sounded beautiful. At first i wondered if it was the choristers practising, but it was a group of ordinary people singing unaccompanied. I wonder whether some of the things we say and do have a greater impact than we could imagine, or appear more beautiful to others than we can believe? Anyway, as part of our time together we had a few prayer stations. 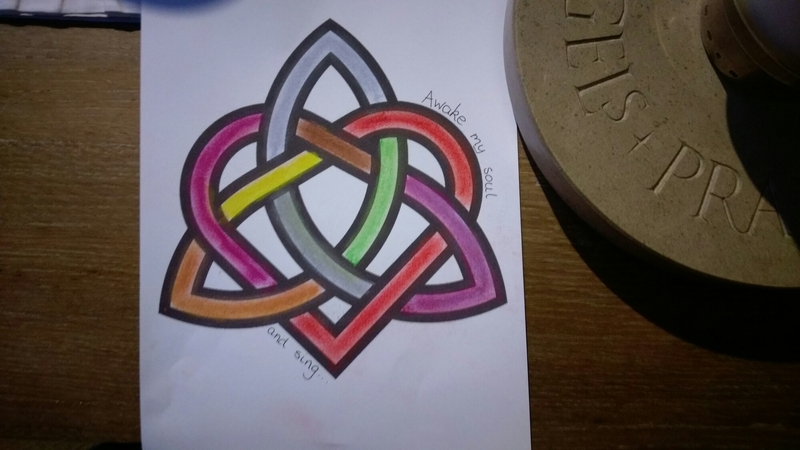 I chose to colour the celtic knot, and decided on pastels which I’ve never really used before. I wanted to make each section a different colour of the rainbow and i planned it out in terms of how many sections there were, but part way through filling them in i realised the flaw in my plan as there were no blues! I played with blending the lilac colour with other colours to make them look different. 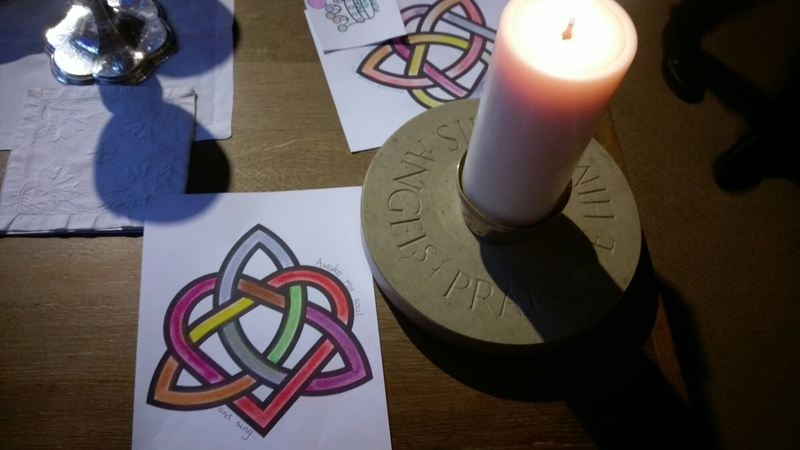 It’s not my greatest piece of artwork, not least because i was doing it in a faintly candle lit area, but i enjoyed the process of putting colour down and smoothing/blending it with my finger. Sometimes i need to remember that the end product is not so important as the process or journey of getting there (in life as well as in art). Things can have a valid purpose even if they don’t end up looking how we’d like them to. And finally i added my prayer for this year. Words from a hymn that we sang this morning (crown him with many crowns) :awake my soul and sing. Right now I’m not sure where i am in my journey with God but my prayer is that my soul will ‘wake up’ and connect with Him. Well this is not exactly my normal thing but i figure it was creative, so I’ll include it here. It’s not all my colouring! I spent a happy half hour this afternoon with a lovely 3 year old called Benjamin, and together we decided on colours for different things. 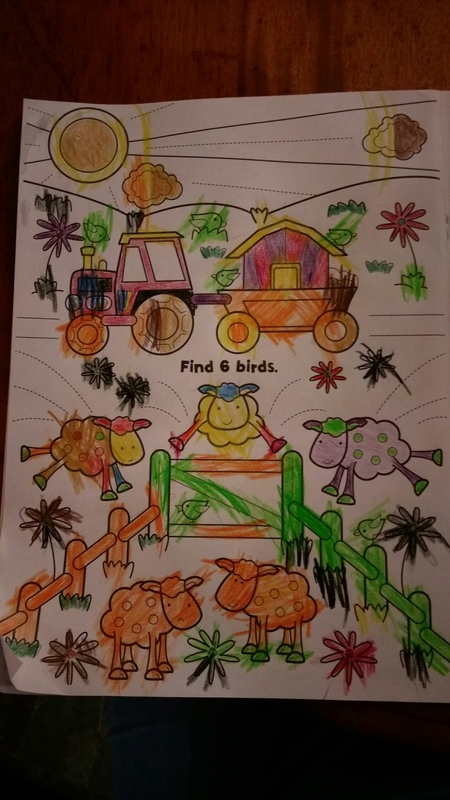 I loved how he decided that we should colour the tractor in purple and orange so that it was both our favourite colours! What i found creative and i guess educational for me was playing around with colours. He wasn’t bound by what colours things ‘should’ be, but what colours he liked, or what colours we hadn’t used yet from the selection of crayons we had. I loved the multicoloured effect we ended up with, and i loved the collaborative effect, especially when we drew lines down the middle of some things so we could colour half each in our colour. Maybe I’ll try playing around with colours in the next thing i draw…. We’ll see! This is a project i started ages ago. 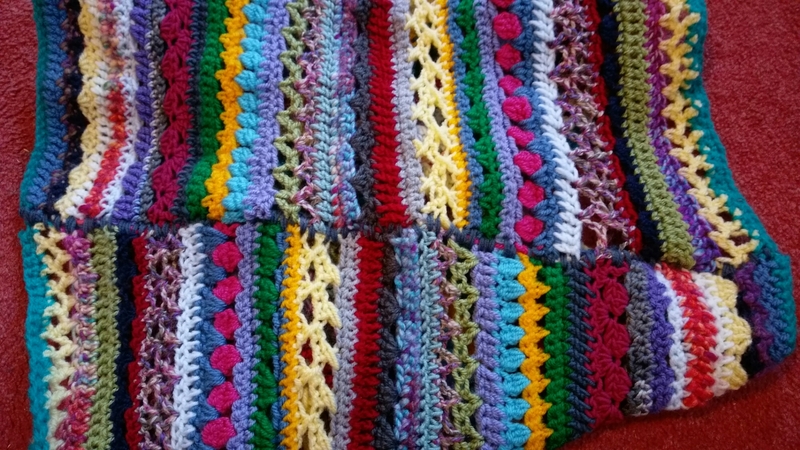 It was going to be a poncho as i’d come across an idea where you could crochet two rectangles and then sew them together in a clever way that would turn it into a poncho once you’d sewn in a neck line. 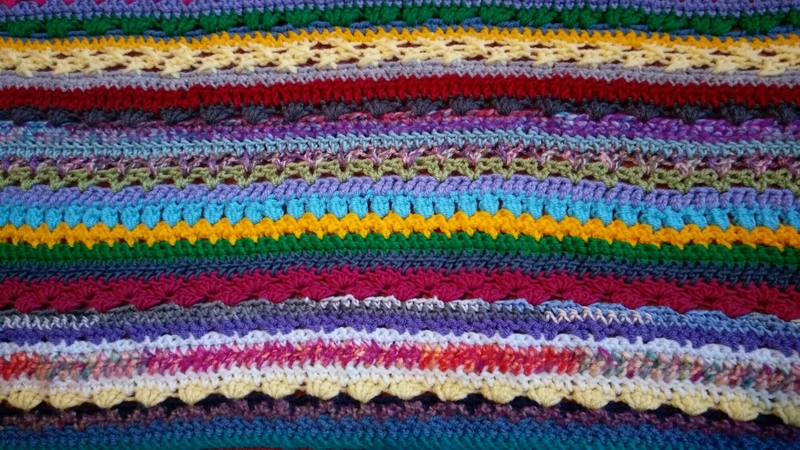 I used it as an opportunity to use up different colours that i had in my wool box, and to try out different stitches. 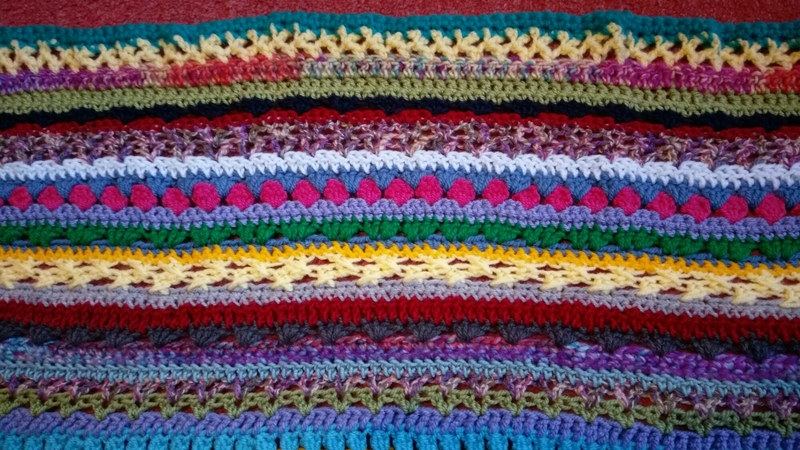 Prior to this I’d pretty much only done double and treble crochet but here i tried lots of different things, which will give me confidence in using them in other patterns. 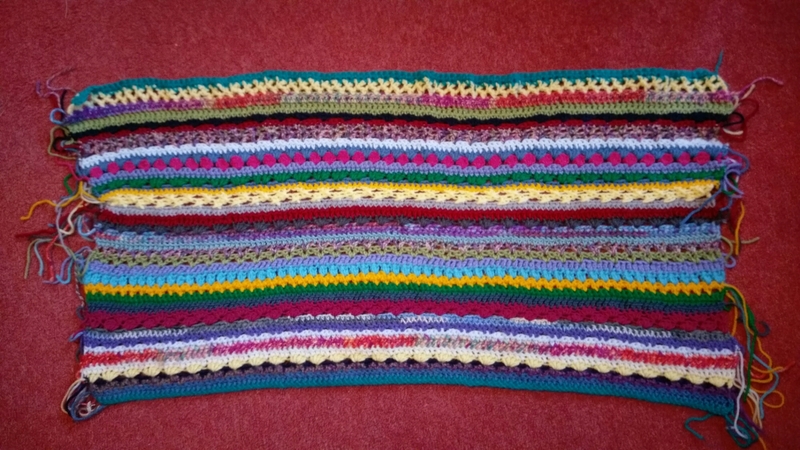 As the rectangle progressed though i realised that even by my standards it was going to be too bright and colourful to wear as a poncho. 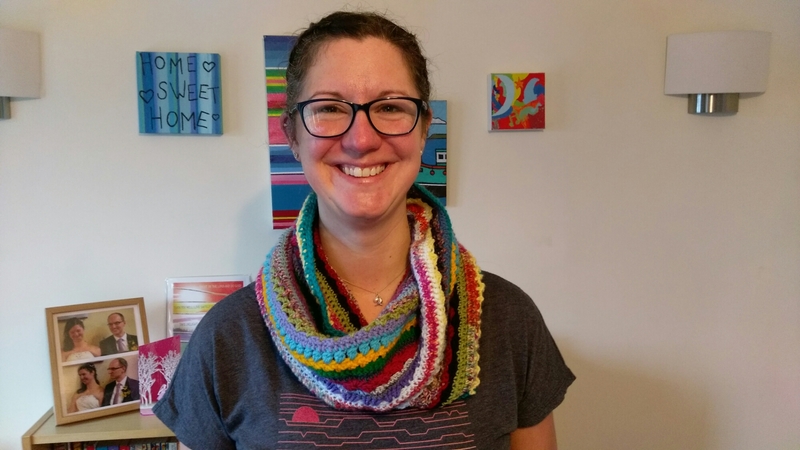 A friend of ours suggested turning it into an infinity scarf. That seemed like a good idea, but that was back in November and i still hadn’t done anything about it! This morning the fact that i hadn’t blogged for a few days, linked to the fact that we’re seeing that friend this afternoon motivated me to just get on with it! So i sat next to our newly adopted guinea pigs, peppa and rosie, and crocheted while listening to their soothing sound of munching on hay! 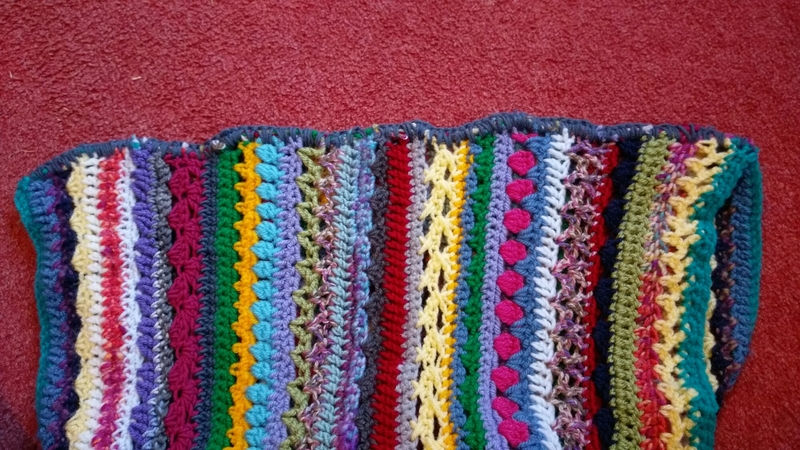 I decided to crochet the edges together, which I’ve never done before, and rather than try to sew all the ends in (far too many ends to thread!) i’d try to hook them under the crochet as i went. or the bit when i turn it inside out. But it’s an infinity scarf/snood thing, and really, who’s gonna look that closely at it when I’m wearing it?! I’m pleased with the end product, and I’m super pleased that I’ve finally turned that rectangle into something I’ll enjoy wearing during the rest of the winter. Now to figure out my next creative project and hopefully not leave it so long!